Guess who has dreamed of seeing Bon Jovi in concert for, oh, about 12 years now? My freshman year of college there was a certain road trip to Las Vegas. "Living on a Prayer" came on the radio and I busted that thing out at the top of my lungs. Apparently I'd been too wrapped up with my studies for any of my peers to know I'm awesome and amazing in every way, but they all said, at that moment, they knew I was a friend for keeps. How precious. Needless to say, for that reason and many, many others (hello, have you seen him? 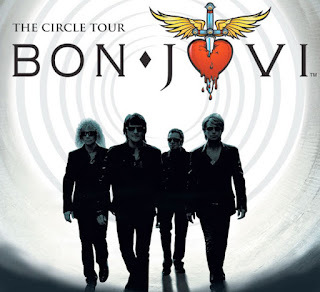 ), I added "see a Bon Jovi concert" to my as-of-yet-unwritten bucket list. Guess who just bought herself lower-bowl tickets for Salt Lake City on March 22? So jealous...would totally love to see that!! And how can I forget Livin on a Prayer!